Glarus lies on the river Linth between the foot of the Glärnisch (part of the Schwyzer Alps) to the west and the Schilt (Glarus Alps)to the east. Very few buildings built before the fire of 1861 remain. Wood, textile, and plastics, as well as printing, are the dominant industries. The symbol of the city is the neo-romanesque city church. The official language of Glarus is (the Swiss variety of Standard) German, but the main spoken language is the local Alemannic Swiss German dialect. 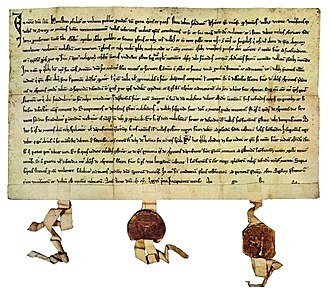 On 10 February 878, the Emperor Charles the Fat gave his wife Richgard or Richardis the monasteries of Säckingen, of St. Felix and of Regula in Zürich as a royal estate. This land grant included extensive political rights and a large estate. This estate covered land in the Rhine and Frick valleys, the southern Hotzenwald, land in Zürich, along Lake Walen and the valley of Glarus. Glarus remained under the Säckingen Abbey until 1395 (intermittently under the overlordship of either the Counts_of_Lenzburg and Kyburg and/or Raetia Curiensis) , when the Glarus valley broke away from the Abbey and became independent. The town is located in the Glarner Mittelland on a broad valley floor between the Glärnisch and the Linth. The municipality Glarus before 2011 had an area of 69.2 km2 (26.7 sq mi). Of this area, 23% was used for agricultural purposes, while 31.4% was forested; of the rest of the land, 2.7% was settled (buildings or roads) and the remainder (42.9%) was non-productive (2006 figures). With the incorporation of Ennenda, Netstal and Riedern in 2011, the municipality Glarus now has an area of 103.67 km2 (40.03 sq mi). Based on the 2004/09 survey, about 26.3% of the total area is used for agricultural purposes, while 34.3% is forested. Of the rest of the land, 4.1% is settled (buildings or roads) and 35.2% is unproductive land. Over the past two decades (1979/85-2004/09) the amount of land that is settled has increased by 42 ha (100 acres) and the agricultural land has decreased by 60 ha (150 acres). Glarus has a population (as of December 2017[update]) of 12,521. As of 2013[update], 24.9% of the population are resident foreign nationals. Over the last 3 years (2010-2013) the population has changed at a rate of 2.07%. The birth rate in the municipality, in 2013, was 9.8 while the death rate was 8.4 per thousand residents. As of 2013[update], children and teenagers (0–19 years old) make up 20.6% of the population, while adults (20–64 years old) are 61.1% and seniors (over 64 years old) make up 18.3%. Most of the population (as of 2000[update]) speaks German (86.0%), with Italian being second most common (4.8%) and Albanian being third (2.6%). As of 2012[update], there were a total of 8,148 people employed in the municipality. Of these, a total of 175 people worked in 63 businesses in the primary economic sector. The secondary sector employed 2,479 workers in 200 separate businesses. Finally, the tertiary sector provided 5,494 jobs in 923 businesses. In 2013 a total of 2.% of the population received social assistance. In the 2015 federal election the most popular party was the BDP with 49.7% of the vote, followed by the SP with 47.7%. The remaining 2.6% went to unaffiliated or minor party candidates. In the federal election, a total of 3,250 votes were cast, and the voter turnout was 41.1%. The 2015 election saw a large change in the voting when compared to 2011. The percentage of the vote received by the SP increased sharply from 28.9% in 2011 to 47.7% in 2015, while the percentage that the BDP dropped from 57.7% to 49.7%. In 2014 the crime rate, of the over 200 crimes listed in the Swiss Criminal Code (running from murder, robbery and assault to accepting bribes and election fraud), in Glarus was 48.2 per thousand residents. This rate is only 74.6% of the average rate in the entire country. During the same period, the rate of drug crimes was 10.2 per thousand residents, which is similar to the rate in Glarus Süd, but about twice as high as the rate in Glarus Nord. In Glarus about 71.3% of the population (between age 25-64) have completed either non-mandatory upper secondary education or additional higher education (either university or a Fachhochschule). Glarus railway station is on the Ziegelbrücke to Linthal railway line. It is served by the Zürich S-Bahn service S25 between Zürich and Linthal, and by the St. Gallen S-Bahn service S6 between Rapperswil and Schwanden. Both services operate once per hour, combining to provide two trains per hour between Ziegelbrücke and Schwanden. The stations of Ennenda and Netstal are also in the municipality, and served by the same trains. Between 1981 and 2010 Glarus had an average of 144.2 days of rain per year and on average received 1,506 mm (59.3 in) of precipitation. The wettest month was July during which time Glarus received an average of 198 mm (7.8 in) of precipitation. During this month there was precipitation for an average of 14.6 days. The months with the most days of precipitation were July and August. The driest month of the year was February with an average of 85 mm (3.3 in) of precipitation over 9.4 days. Fritz Künzli (born 1946 in Glarus) a retired Swiss football striker. ^ a b Glarus in German, French and Italian in the online Historical Dictionary of Switzerland. ^ Lothar Deplazes: Raetia Curiensis in German, French and Italian in the online Historical Dictionary of Switzerland. ^ Säckingen in German, French and Italian in the online Historical Dictionary of Switzerland. ^ Glarus from the High Middle Ages until the 18th Century-Churches in German, French and Italian in the online Historical Dictionary of Switzerland. ^ Glarus in the 19. and 20. 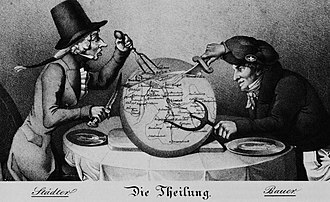 Centuries-Political and administrative development in German, French and Italian in the online Historical Dictionary of Switzerland. ^ "Güterschuppen 8750 Glarus" (in German). Schweizer Heimatschutz.ch. Archived from the original on 30 December 2013. Retrieved 2013-05-22. ^ Chisholm, Hugh, ed. (1911). "Glarus (capital)" . Encyclopædia Britannica (11th ed.). Cambridge University Press. ^ "S-Bahn trains, buses and boats" (PDF). ZVV. Archived from the original (PDF) on 28 July 2014. Retrieved 2014-08-08. ^ a b "Climate normals Glarus (Reference period 1981−2010)" (PDF). Zurich-Airport, Switzerland: Swiss Federal Office of Metreology and Climatology, MeteoSwiss. 2 July 2014. Retrieved 2016-02-21. ^ "Wiesbaden's international city relations". City of Wiesbaden. Retrieved 24 December 2012. Glarus (municipality) in German, French and Italian in the online Historical Dictionary of Switzerland. 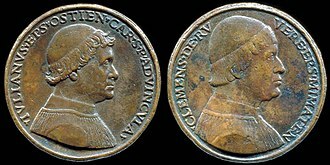 The Battle of Marignano was fought during the phase of the Italian Wars called the War of the League of Cambrai, between France and the Old Swiss Confederacy. It took place on September 13 and 14,1515, near the today called Melegnano,16 km southeast of Milan. 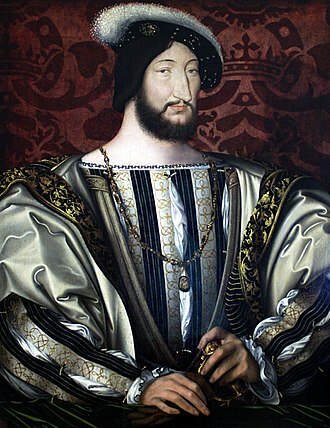 It resulted in a victory for French forces, with Francis were German landsknechts, bitter rivals of the Swiss for fame and renown in war, and his late arriving Venetian allies. The campaign of Marignano followed years of Swiss successes, during which French fortunes in Northern Italy had suffered greatly, the prologue to the battle was a remarkable Alpine passage, in which Francis hauled pieces of artillery over new-made roads over the Col dArgentière, a previously unknown route. This was, at the time, considered one of the foremost military exploits of the age, at Villafranca the French, led by Jacques de la Palice and captured the Papal commander, Prospero Colonna, in a daring cavalry raid deep behind the allied lines. Colonna and his staff aside, the French seized a great deal of booty on the raid, the capture of Colonna, along with the startling appearance of the French army on the plains of Piedmont, stunned the allies. 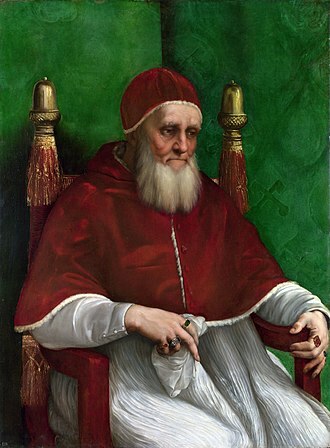 The Pope and the Swiss both sought terms with Francis, while the Spanish allies en route from Naples halted to await developments. 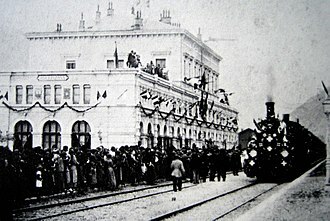 The main Swiss army retreated to Milan, while a faction, tired of the war and eager to return home with the booty of years of successful campaigning. 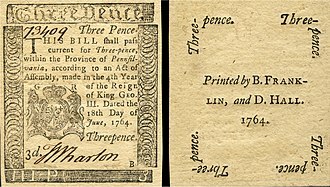 Schiner pointed out the profits of victory, appealed to national pride. The suddenly enthusiastic Swiss sprang to arms, issuing forth from Milan in disciplined but frenzied columns, the Swiss encountered Franciss forces at the little burnt-out village of Marignano on a featureless plain. A treaty signed, the French were not expecting battle, Francis was in his tent, trying on a new suit of armor, when scouts reported the coming of the Swiss. Each division was a combined force of infantry and artillery. Massed in front of Francis’ center division was a battery of seventy-two field guns guarded by the infamous Black Legion. Also with the division was the Chevalier Bayard and his company. Close to sunset, the Swiss approached the French in three divisions of their own, each a mass of pikemen. The Glarus Alps are a mountain range in central Switzerland. They are bordered by the Uri Alps and the Schwyz Alps to the west, the Lepontine Alps to the south, the eastern part of the Glarus Alps contains a major thrust fault which was declared a geologic UNESCO world heritage site. The Glarus Alps extend well beyond the canton of Glarus, including parts of the cantons of Uri, Graubünden, and St Gallen. The main chain of the Glarus Alps can be divided into six groups, separated from each other by passes. The westernmost of these is the Crispalt, a range including many peaks of nearly equal height. The highest of these are the Piz Giuv and Piz Nair, the name Crispalt is given to a southern, but secondary, peak of Piz Giuv, measuring 3,070 m. West of the group is the Rienzenstock, while a northern outlyer culminates in the Bristen. East of the Crispalt, the Kreuzli or Chrüxli Pass separates this from the higher mass of the Oberalpstock. Here occurs a partial break in the continuity of the chain, two glacier passes lead over this part of the chain — one to west, over the Brunnigletscher to the Maderanertal, the other to the north-east, over the Sand Glacier, to the Linthal. The Tödi, the highest of the range and of north-eastern Switzerland, is attended by numerous secondary peaks that arise from the extensive snow-fields surrounding the central mountain, a less important branch encloses the Biferten Glacier, and terminates in the Selbsanft, south of Tierfehd. Towards the valley of the Vorderrhein a high promontory stretches nearly due south from the peaks of the Tödi. Another considerable ramification of the same mass terminates farther to the east in the peak of the Cavistrau. The Kisten Pass separates the Tödi group from the Hausstock, whose summit attains 3,158 m, the Hausstock is cut off from the rather lower but more extended mass of the Vorab by the Panixer Pass. Numerous summits, of which the Vorab proper and Piz Grisch are the most important, approach very near, but do not quite attain to 10,000 feet. Main glaciers, Hüfi Glacier Limmern Glacier Biferten Glacier Vorab Glacier The chief passes of the Tödi Range, from the Oberalp Pass to the Klausen Pass, Note, road status as of 1911. Einsiedeln is a municipality and district in the canton of Schwyz in Switzerland known for its monastery, the Benedictine Einsiedeln Abbey. Einsiedeln is the birthplace of Paracelsus, a Renaissance physician, the town is known as Äinsidle, in the local Highest Alemannic dialect, and in neighboring dialects as Äisele, Näisele, Äisidle, Näisidle, Äisigle. In the Romansh language it is known as Nossadunaun, archaeologists have discovered numerous artifacts from the stone age and the Bronze Age in the Einsiedeln area. However, it appears from these artifacts, some of which are about 12,000 years old, until the Early Middle Ages there were no permanent settlements in the area. St. Meinrad, of the family of the Counts of Hohenzollern and he established his hermitage on the slopes of Mt. Etzel. 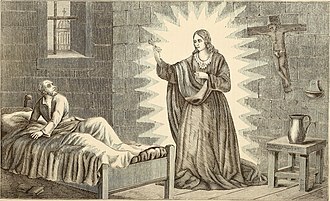 When he arrived in the area, he had him a wonder-working statue of the Virgin Mary which he had been given by the Abbess Hildegarde of Zurich. Near his hermitage, he established a shrine to house the statue. According to legend he died in 861 at the hands of two robbers and Peter, who coveted the treasures offered at the shrine by pilgrims, the robbers were followed by two ravens into town and drew attention to them with loud squawking. This is the reason for the two ravens on the village flag, during the next eighty years Saint Meinrads hermitage was never without one or more hermits emulating his example. One of the hermits, named Eberhard, previously Provost of Strasburg, erected a monastery and church there, work on the monastery is said to have begun in 934. Following a miraculous vision by Eberhard, the new church was dedicated to the Virgin Mary, while the town of Einsiedeln is first mentioned in 1073, monastery and the area around were settled earlier. At the time of the foundation of the Abbey, the hunters and small farmers of the forest. The surrounding population was known as Waldleute because of the forests around the Abbey, the Abbey encouraged the Waldleute to settle in surrounding villages and begin farming. The alpine valleys were used to raise cattle, which became more important to the village. By 1250 the major business in the village was breeding and raising cattle, expansion of grazing land into nearby alpine valleys led to a two century conflict with Schwyz. 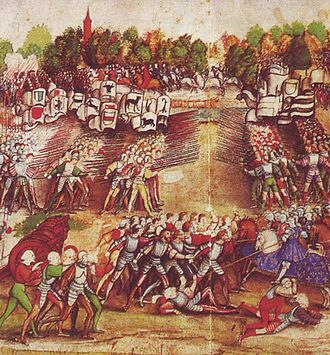 The Second War of Kappel was an armed conflict in 1531 between the Protestant and the Roman Catholic cantons of the Old Swiss Confederacy during the Reformation in Switzerland. Additionally, the Roman Catholic party accused Zürich of territorial ambitions, while the Tagsatzung had successfully mediated in 1529, on this occasion the attempt failed, not least because Zwingli, the Protestant leader, was eager for a military confrontation. 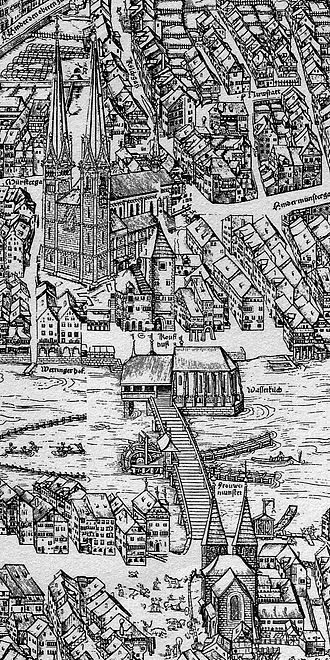 Pressed by the embargo, the Catholic cantons declared war on Zürich on 9 October 1531. On 11 October 1531 a force of approximately 7,000 soldiers from the five Catholic cantons met an army of only 2,000 men from Zürich at the Battle of Kappel. Zürichs army was unsupported by the other Protestant cantons and was led by Zwingli, the main Zürich force arrived at the battlefield in scattered groups and exhausted from a forced march. The Catholic forces attacked and after a resistance, the Protestant army broke around 4 in the afternoon. 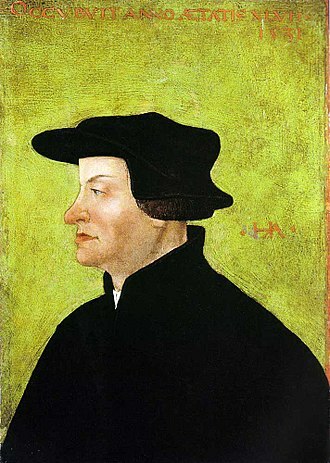 About 500 Protestants were killed in the battle and while fleeing, among the dead was Zwingli and twenty-four other pastors. Zwinglis body was taken by the victorious Catholic army and burned as a heretic, after the defeat, the forces of Zürich regrouped and attempted to occupy the Zugerberg, and some of them camped on the Gubel hill near Menzingen. Following the defeat at Kappel and other Reformed Cantons marched to rescue Zürich, between 15–21 October, a large Reformed army marched up the Reuss valley to outside of Baar. At the same time, the Catholic army was now encamped on the slopes of the Zugerberg, the combined Zürich-Bern army attempted to send 5,000 men over Sihlbrugg and Menzingen to encircle the army on the Zugerberg. However, the Reformed army marched slowly due to poor discipline, by the night of 23–24 October, they had only reached Gubel at Menzingen. 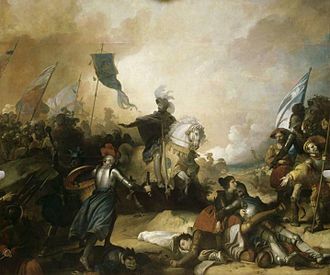 That night they were attacked by a small Catholic force from Aegeri, about 600 Protestant soldiers died in the attack and the panicked retreat that followed. 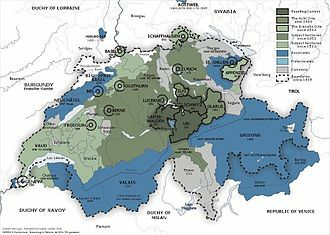 This defeat destroyed much of the combined Zürich-Bern army and, faced with increasing desertion, the retreat left much of Lake Zürich and Zürich itself unprotected. Zürich now pushed for a peace settlement. In an isolated incident near Île d'Aix, the crew of the vastly outgunned corvette Bayonnaise boarded the British Ambuscade and won her, in some of the bloodiest hand-to-hand fighting of 1798.